The NASA InSight lander survived a perilous descent through the thin Martian atmosphere and successfully landed on a flat part of the Red Planet on Monday at 2:54 p.m. ET. It has already transmitted its first picture back to Earth. Why it matters: The landing marks the first robot to successfully land on Mars since NASA's Curiosity rover touched down in 2012. The InSight lander arrived on the planet after completing a nearly 300 million mile trip from Earth. It survived a descent referred to by mission controllers as "seven minutes of terror," during which time the spacecraft followed a series of predetermined maneuvers to slow it down enough for a smooth touchdown. 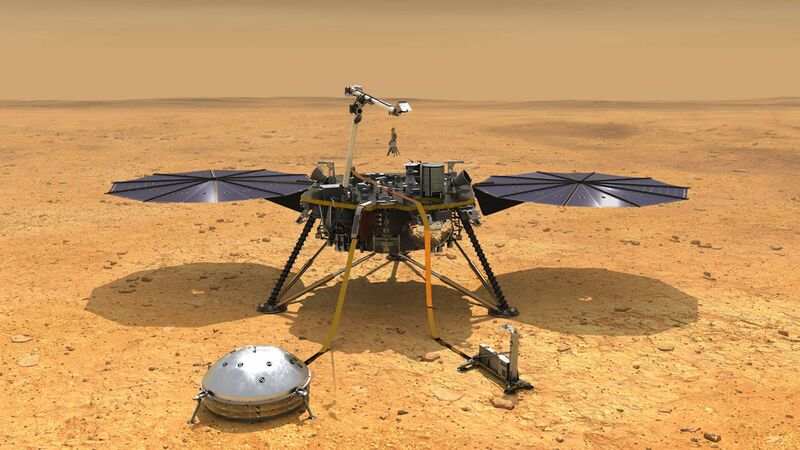 What it's doing there: Unlike other spacecraft sent to Mars, the InSight lander is not designed to seek signs of life, but rather to investigate the planet's interior for clues into how certain planets, including Earth, formed about 4 billion years ago. Mission controllers celebrate the landing on Nov. 26. What we don't know: While we know the spacecraft touched down and sent a "ping" to Earth, indicating it's alive and functioning on the planet, we don't know yet how well the spacecraft survived the rough approach. Scientists are still waiting for confirmation from NASA's Mars Odyssey orbiter, which is orbiting the planet, that InSight's solar arrays have deployed. The one-way time for a signal to reach Earth from Mars is 8 minutes and 7 seconds on Nov. 26, NASA stated. The big picture: The U.S. is the only country to have successfully landed spacecraft on Mars, but a glitch-free landing was by no means guaranteed. InSight will be the first spacecraft to drill down into the deep interior of Mars, and scientists hope the data it gathers will give them clues into how the planet formed. The information it gathers could even shed light on how our home planet and others in our solar system evolved. "InSight will address a fundamental issue of solar system science, not just specific questions about a single planet. By studying Mars, InSight would illuminate the earliest evolution of rocky planets, including Earth." Details: The InSight lander entered the planet's atmosphere at a dizzying speed of about 12,300 mph, and friction heated the spacecraft up to 2,700°F. The spacecraft experienced about 8 times the force of gravity during its descent, according to NASA. A supersonic parachute and retro-rocket thrusters worked to slow it down sufficiently for a three-legged, soft landing on the Elysium Planitia — a flat region near the planet's equator. This landing differed from some of the previous rover landings, which involved a bouncing ball-like structure with the rovers sheltered inside. Two miniature spacecraft, known as Mars Cube One, are following InSight, but they won't land on Mars. Instead, they'll serve as data relay stations to send information gathered by InSight to scientists on Earth. They are the first-ever CubeSats, which are a category of ultra-small satellites, to go into deep space. The mission isn't entirely a NASA operation. Several European institutions have contributed to its payload, including France's Centre National d'Études Spatiales and the German Aerospace Center.